Friday 17th April is Palestinian Prisoners Day, a day of solidarity with the 6500 Palestinian men, women and children who are languishing in Israeli dungeons. 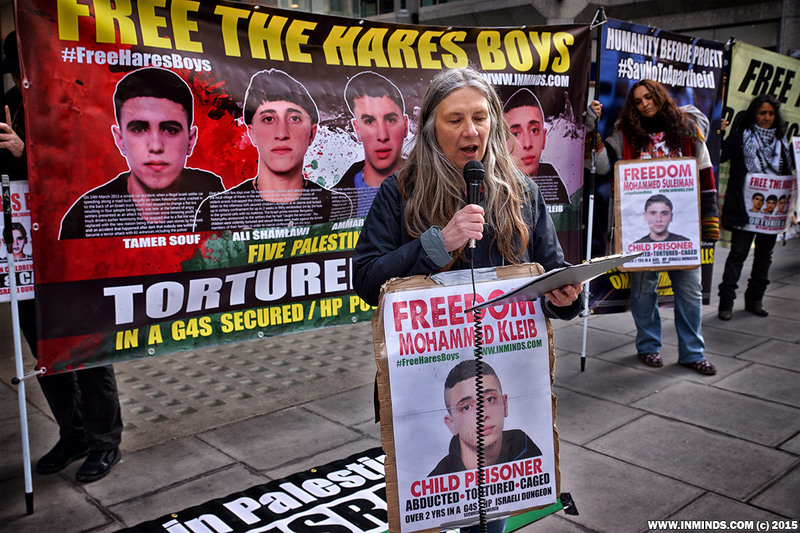 Please join us outside the headquarters of the British security contractor G4S, which secures many of the dungeons and torture dens where Palestinians are caged and abused, to demand freedom for all Palestinian political prisoners. 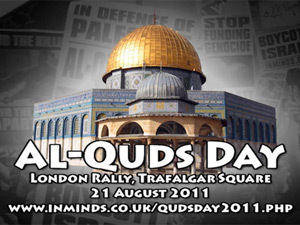 There will be several themes for this years Prisoners Day. 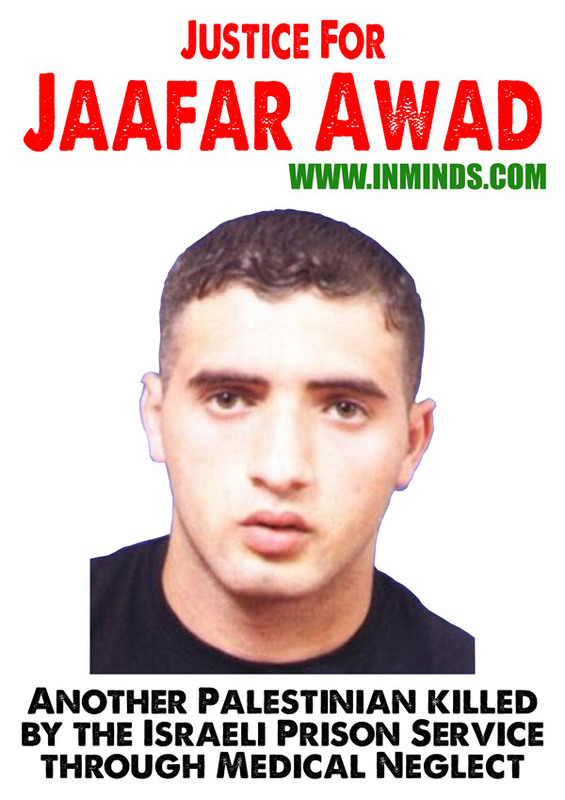 We will demand justice for Jaafar Awad who was killed last friday 10th April 2015 by the Israeli Prison Service through gross medical negligence. 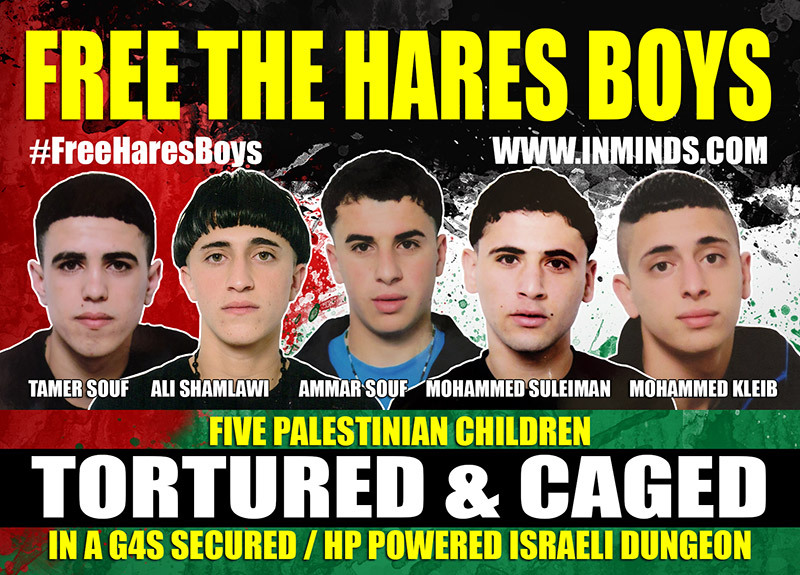 And we will demand freedom for the 182 Palestinian children currently caged by Israel including 15 years old schoolboy Khaled Sheikh and the five Hares Boys abducted over 2 years ago. We will demand the immediate release of Palestinian MP Khalida Jarrar and the other 13 members of the Palestinian Parliament imprisoned by Israel, 8 of whom are being held under illegal rolling administrative detention orders without charge or trial . We will demand freedom for Mona Qa'adan who was recently given an arbitrary sentence of 70 months for organising grass roots women's associations against the occupation. She was abducted two and a half years ago and in all that time has been prevented from seeing her family even once. And we will demand freedom for Palestinian human rights lawyer Shireen Issawi and her brothers whose whole family have all been targeted by the occupation. And we will especially not forget Lina Jarbouni, the longest servicing Palestinian woman prisoner - April 18th marks her 13th year in an Israeli dungeon! Jaafar Awad, a 22 years old Palestinian student was abducted by the occupation on 1st November 2013 from his town of Beit Ummar, which is constantly being targeted by Israeli forces with 60 residents having been abducted in just the last 3 months alone (Jan-Mar 2015), nearly half of them children. 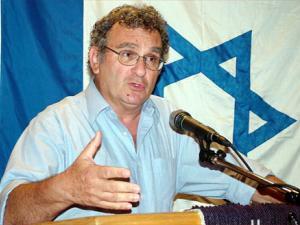 Israel caged Jaafar at Eshel prison for 14 months without trial. With the appalling conditions in prison a previously healthy Jaafar suddenly fell ill and his health deteriorated rapidly after he was administered the wrong insulin shots causing his neck to swell, heart problems, complications of the thyroid and pancreas, loss of ability to speak and walk, trembling of the body and loss of vision in one eye. After ignoring several appeals for his release Israel finally released him on 21 January 2015 on payment of over $10,000 USD ransom. He was in critical condition and had to be rushed to the Palestinian al-Ahli hospital in Hebron. His father Ibrahim Awad recalls the first time he saw his son after his release, "I was shocked by my son's health condition when I saw him; we could only use eye contact to communicate with him.."
It was too late, ill equipped Palestinian hospitals under occupation dont have the facilities to treat Jaafar's condition and with Israel refusing to admit Jaafar to its Hadassah hospital, Jaafar died 2 months later at 2:24am on 10th April 2015. With his death, the number of Palestinian prisoners killed by Israel has now reached 209. At Jaafar's funeral Israeli forces opened fire on the mourners killing Jaafar's cousin Ziyad Awad and injuring 13 others. 27 years old Ziyad, with his whole life in front of him, was shot in the back for demanding justice for his cousin. On 14th March 2013 a simple car accident, when a illegal Israeli settler car speeding along a road built illegally on stolen Palestinian land, crashed in to the back of an Israeli truck which had stopped to change a flat tire resulting in four people being hurt, was later at the behest of angry settlers presented as an attack by Palestinian stone throwing youth. The truck drivers earlier testimony that he stopped due to a flat tire was replaced with the new reason being that he had seen stones by the road, and an accident that happened after dark that nobody saw suddenly became a terror attack with 61 witnesses including the police! Over the next few days over 50 masked Israeli soldiers with attack dogs stormed the local village of Hares in the early hours of the morning and in waves of violent arrests kidnapped the children of the village. In total 19 children were taken to the infamous G4S secured children's dungeon at Al Jalame and locked up in solitary confinement for up to 2 weeks in filthy windowless 1m by 2m hole in the ground cells with no mattress. The Israeli prime minister Benyamin Natanyahu announced to the settlers that he had caught the terrorists?. The children were violently tortured and sexual threats were made against the female members of their families in order to coerce confessions from the boys. With the confessions and the new eye-witness? statements, five of the Hares boys were charged with 25 counts of attempted murder each, even though there were only four people in the car. Apparently the military court had decided that 25 stones were thrown, each with an "intent to kill". The five boys have been illegally transferred to Israel, in contravention of Article 76 of the Fourth Geneva Convention, to Megiddo prison where G4S provides the entire central command room. Hewlett Packard provides technical services and central servers that keep Israels dungeons and torture dens, including Megiddo, operational. In violation of international law Israel has turned prisons in to money making enterprises with the boys essentially forced to pay for their own imprisonment. Israel deliberately fails to provide Palestinian prisoners the basic essentials - edible food, cloths (underwear, shoes..) and hygiene products (soap, toothbrush..). The boys are forced to buy these at the extortionately priced prison shop costing the families over 125 euro/month to provide for one child's basic needs in prison. With no evidence of a crime the military court keeps on postponing the hearing dates from one month to one year to two years, meanwhile the boys remain caged indefinitely and their families facing financial ruin in the process. A court hearing entails the families spending most of their day queuing and enduring the humiliation at the checkpoints where HP provides the biometric systems used to tag Palestinians, then waiting at the court in anticipation of catching a glimpse of their son.. often to be disappointed as hearing are cancelled without notice. 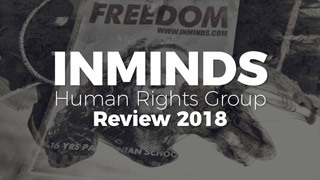 The United Nations Children's Fund UNICEF report on Children in Israeli Military Detention concludes that Israel is the only country in the world where children are systematically tried in military courts that by definition fall short of providing the necessary guarantees to ensure respect for their rights. The conviction rate in Israeli military courts is an unfathomable 99.74%. If the five boys are convicted they will be locked up for over 25 years - five young lives ruined with no evidence of a crime let alone their guilt. On Christmas day last year Israeli soldiers abducted 15 years old Khaled Sheikh from outside his home in Beit 'Anan in Jerusalem. 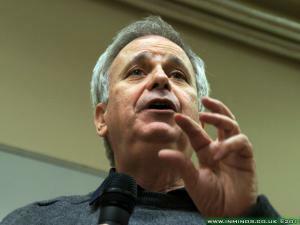 He has been caged in Israel's notorious G4S secured Ofer prison for over three months now. 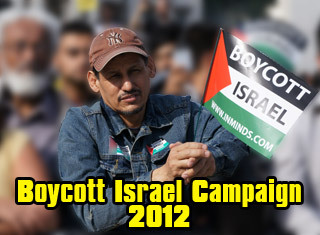 Israel has denied him any family visits and he has been denied essential medical treatment. Accused of throwing a stone, Israel's military court on 25th February, true to its 99.74% conviction rate, sentenced Khaled toÂ 4 months imprisonment and in addition fined him $500. 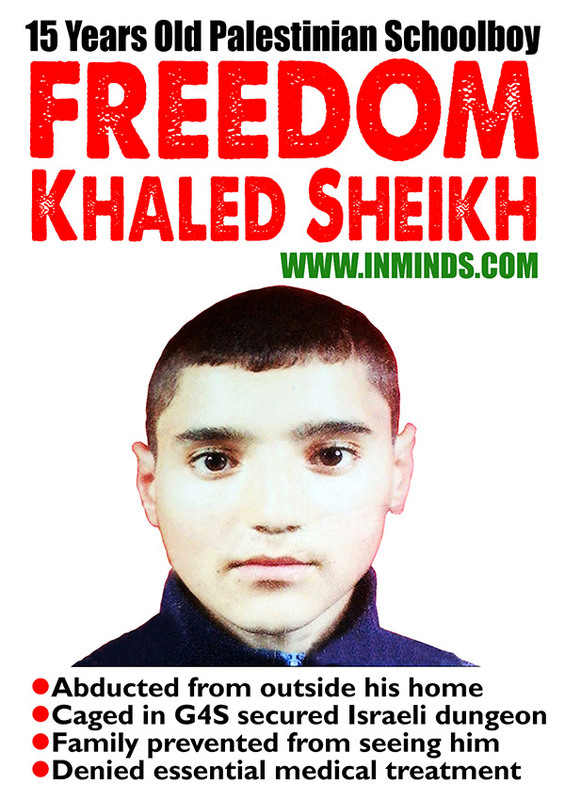 Khaled suffers from several health issues including anaemia and has been denied his medication since his abduction in December. 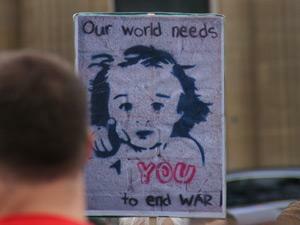 His family are fearful for his health and are urging activists around the world to intervene to secure the release of their son. 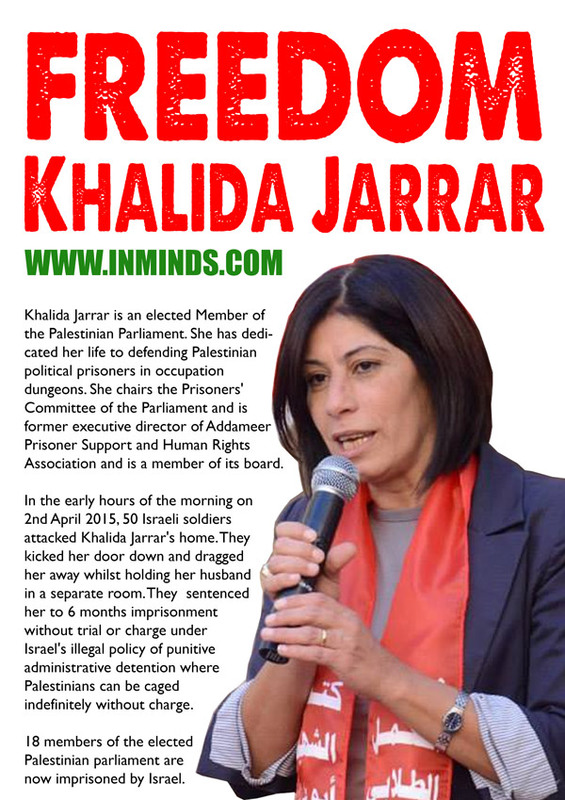 Khalida Jarrar is an elected Member of the Palestinian Parliament. She has dedicated her life to defending Palestinian political prisoners in occupation dungeons. She chairs the Prisoners' Committee of the Parliament and is former executive director of Addameer Prisoner Support and Human Rights Association and is a member of its board. On 1st April 2015 Khalida Jarrar spoke passionately against the Israeli backed Saudi bombing of Yemen at a rally in Ramallah. In the early hours of the next morning, on 2nd April 2015, dozens of Israeli soldiers raided her home, kicked her door down and dragged her away whilst holding her husband in a separate room. 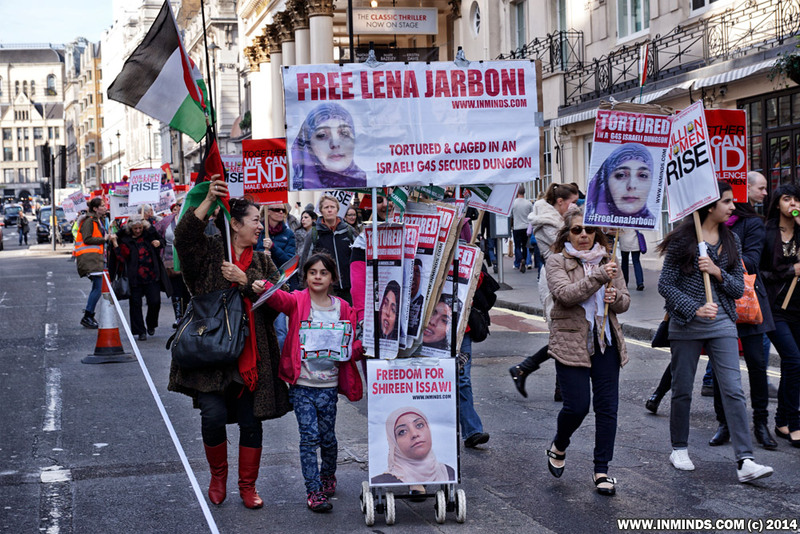 They sentenced her to 6 months imprisonment without trial or charge under Israel's illegal policy of punitive administrative detention where Palestinians can be caged indefinitely without charge. 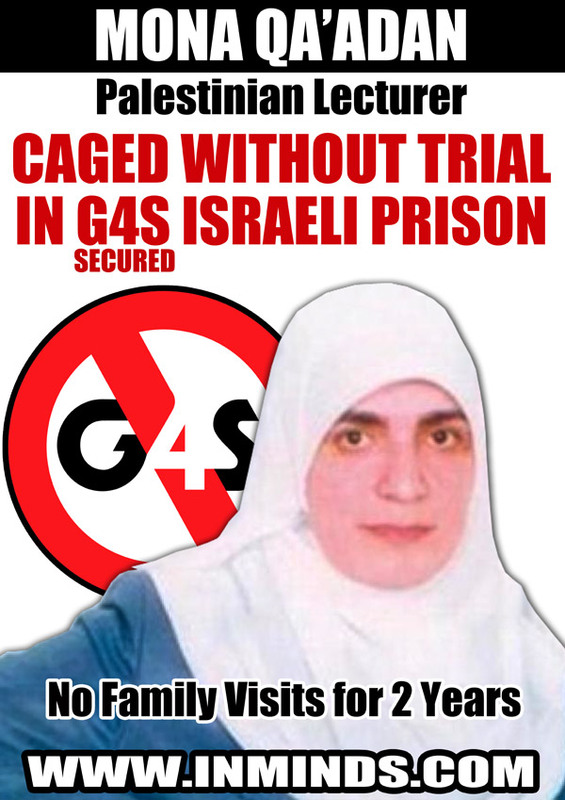 She is caged at Israel's G4S secured HaSharon prison. This isn't the first time the occupation has targeted Khalida Jarrar. Last August Israel tried to enforce an illegal expulsion order, expelling her from her home in Ramallah to exile in Jericho effective within 24h. Jarrar refused to sign the expulsion order, saying you, the occupation, are killing our Palestinian people. You practice mass arrests, demolish homes, kidnap people from their homes and deport them. It is you who must leave our home.? The expulsion order violated the Fourth Geneva Convention which prohibits such forced transfers. Khalida Jarrar moved in to a protest tent? outside the Palestinian parliament building in Ramallah. She announced that she was going to stay and continue her work from there until the decision is revoked. She won and the illegal order was revoked. There are now 14 members of the elected Palestinian parliament imprisoned by Israel, 8 of them including Khalida Jarrar are being held under illegal punitive Administrative detention orders. Female Palestinian university lecturer Mona Qa'adan was abducted nearly two and a half years ago in November 2012. Since then she has not been allowed a single family visit. Her entire family - four sisters and three brothers, have all been labelled a "security threat" and prevented from talking to her for even a single minute in two and a half years. Mona's illegal detention has been extended 16 consecutive times since her abduction without any trial. In the meantime she her health is suffering with problems in her gallbladder, stomach and high blood pressure. Finally a couple of weeks ago, at the start of April 2015, she was arbitrarily sentenced to 70 months (nearly 6 years)Â and fined around $7500 USD for organising grass roots women's associations against the occupation. 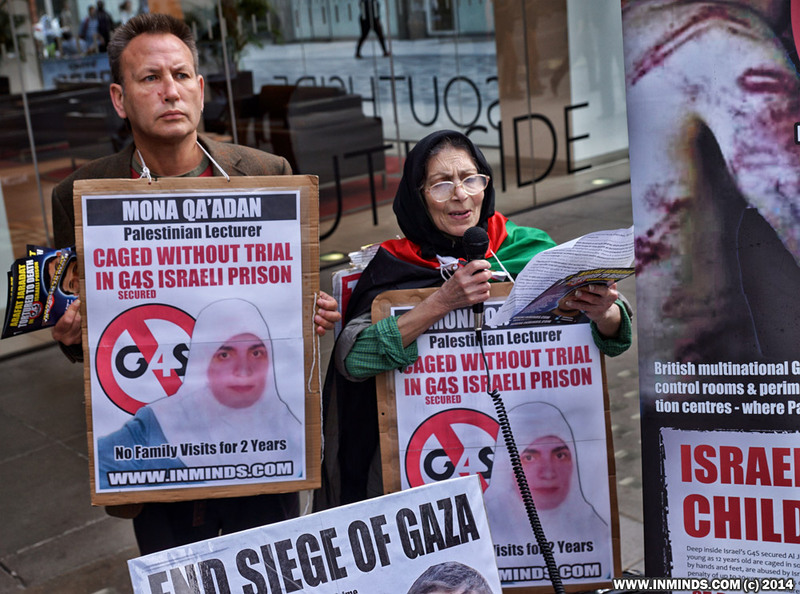 Mona Qa'adan is caged at Israel's G4S secured HaSharon prison. 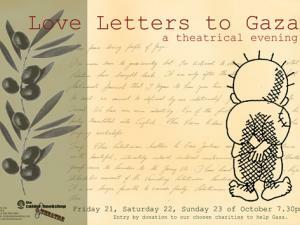 This is the third time Mona has been imprisoned by the occupation. Her first arrest was on August 2 2007, she was released on June 20 2008, then she was kidnapped again on May 31 2011, and was released on November 18 2011 as part of the Shalit prisoner swap deal only to be abducted again a year later. 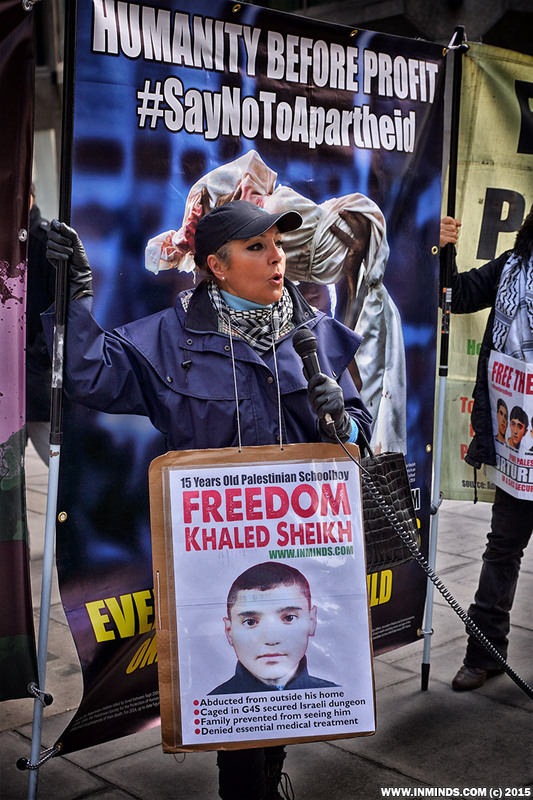 In February 2013 she was placed in solitary confinement as punishment for leading a hunger strike in support of her hunger striking brother Tarek Qa'adan who is still held without charge under rolling administrative detention orders. Lena was born in 1974 to a Palestinian family near Acre in 1948 Palestine. Due to financial difficulty she could not complete her studies and worked in sewing workshops to help her family. In 2002 she was picked up by Israeli security on suspicion of "collaborating with the enemy" - she unlike her Palestinian friends has Israeli citizenship. 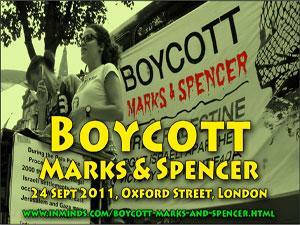 They tortured her for 30 days at Israels notorious G4S secured Al-Jalame torture den. Interrogation sessions lasted up to 20 hours at a time. Deprived of sleep, she was made to stand stationary in stress positions for that time - her joints have never recovered. Between interrogation sessions she was caged in a tiny 1m x 2m hole in the ground cell. They brought her younger brother in and brutally tortured him, beating him mercilessly in front of her to pressure her to confess. When she didn't break they released him and abducted her younger sister and tortured her, and then they dragged her elderly mother to the interrogation room and threatened to torture her. Her frail mother suffers from heart disease, high blood pressure and diabetes. 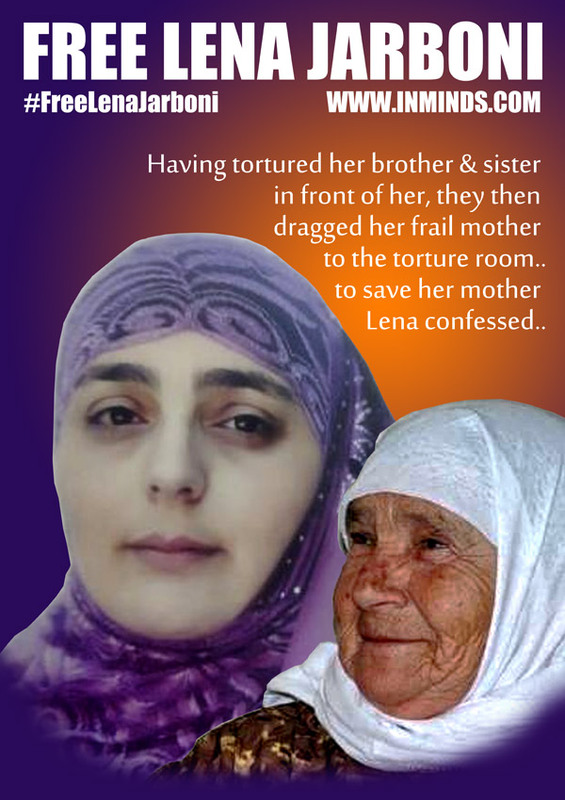 To save her family Lena confessed to the fabricated charges and she was sentenced to 17 years in HaSharon women's prison. At HaSharon prison Palestinian women prisoners have to endure beatings, insults, threats, sexually explicit harassment and sexual violence, and humiliation at the hands of Israeli guards. They are often forced to undergo degrading strip searches during the middle of the night - forced to squat naked and subjected to intrusive internal body searches, for no reason other than as a punitive measure. Women have been beaten and left tied to their bed for a day and a half and not allowed to go to the toilet as punishment for spilling water. The cells at HaSharon prison are overcrowded, dirty and infected with rodents and cockroaches. There is a total absence of basic hygiene, women have even been denied sanitary pads when menstruating. The heat is unbearable, The windows are closed and covered so that hardly any air or daylight can enter. The food is insufficient, and of inferior quality & dirty, often containing insects & worms, at times there are not enough portions for all the women. At HaSharon Lena became the spokeswoman for the other prisoners and converted the squalid rat infested cellars in to an area for prayer and education. She taught sewing classes and Quran. Israel has adopted a systematic policy of medical negligence regarding Palestinian prisoners, a study conducted in 2008 revealed that 38% of Palestinian female prisoners suffer from treatable diseases that go untreated. Due to medical negligence Lena can no longer walk and suffers from extreme pain in her stomach and constant migraines. The prison refused to transfer her to hospital for an essential cholecystectomy operation in time. 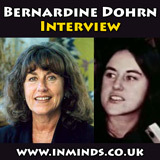 It was only when all the women prisoners threatened to go on hunger strike that they finally allowed her the operation. She has never recovered and her condition is deteriorating. Having endured 13 years in HaSharon prison she is the longest serving Palestinian woman prisoner. She has 4 more years left of her sentence, in her condition it is very unlikely she can survive that. 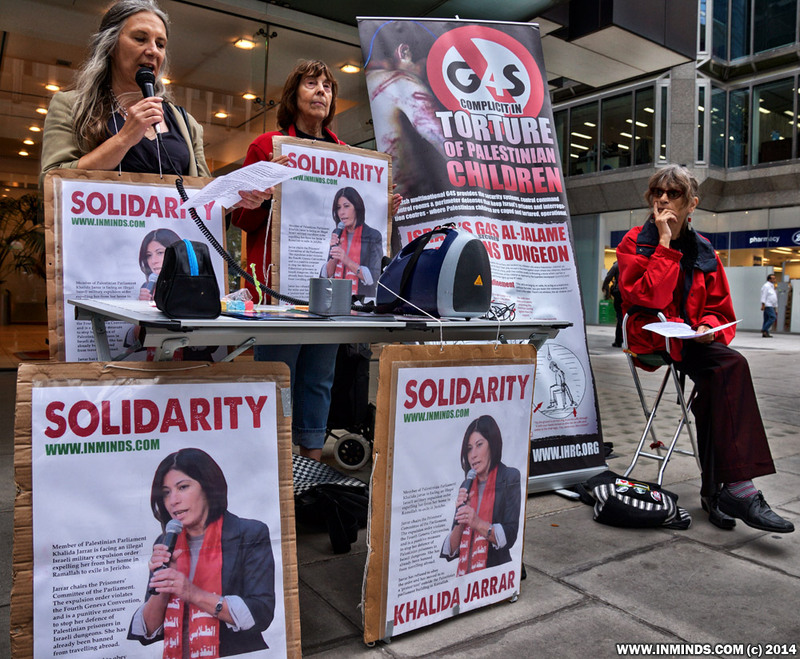 London Protest outside G4S HQ on 2nd April 2015 demanded freedom for the 300 Palestinian children, caged in Israeli G4S secured dungeons, and freedom for Palestinian MP Khalida Jarrar who was abducted from her home by 50 Israeli soldiers in the early hours of the morning of 2nd April.